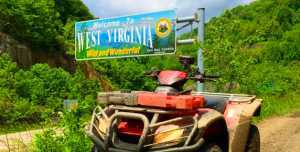 “The best motorized trail system in the USA” ? Don’t just get excited, get ready! Make your preparations today and use our helpful web pages to assist you in getting ready for The Adventure of a Lifetime when you come ride the world famous Hatfield-McCoy Trails! Get a Trail Permit – All riders must have a current trail pass. Permits are available online here, or from many vendors in the region. Check our lists for details! The trail system you plan on riding can help you decide where you may want to stay on your visit to HMT country! Plan Your Gear – Be sure you are prepared to have a safe adventure! Find Area Dealers and Things to Do – When the sun goes down, the fun doesn’t have to end in HMT country. There are plenty of other fun activities for you and your friends and family in our region. Check ‘em out! Maps and Directions – How do you get here from there? Get Area Information – Get complete and updated information from of our many area Visitors Bureaus or Tourism Centers. These folks area always happy to answer any questions and help get your trip moving in the right direction!